The purpose of this study was to measure the operational competitiveness of public protected areas (PPAs) in the KwaZulu-Natal province, South Africa. Financial data for ecotourism operations in PPAs were collected from Ezemvelo KZN Wildlife (EKZNW) for 2007-2013, to construct an operational competitiveness profile for each PPA by using a non-parametric method called operational competitiveness rating analysis (OCRA). The results show that permanent staff, utilities, maintenance and repairs, and cost of sales were cost items with the highest average share of total costs, whereas accommodation, admissions, sales and tours, and rides and hikes received higher average shares of total revenues for most PPAs. The identification of the most important cost and revenue items was followed by the computation of resource consumption and revenue generation inefficiency ratings from 2007 to 2013, with the results showing that resource competitiveness had more impact on operational competitiveness relative to revenue competitiveness. This suggests that PPAs under EKZNW can improve operational competitiveness by reducing costs. Ecotourism is an economic incentive used in several countries to encourage biodiversity conservation. 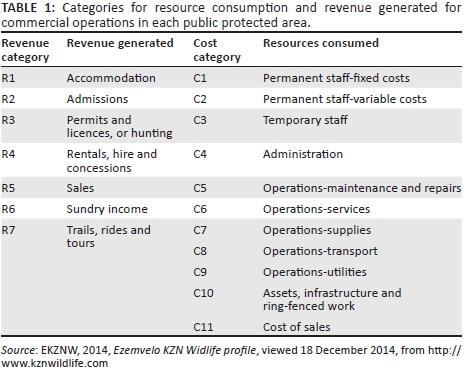 Because of declining public funding, conservation agencies such as EKZNW in South Africa should find new sources of funding or find cost-effective ways of managing ecotourism operations. In South Africa, funding for Ezemvelo KZN Wildlife (EKZNW), KwaZulu-Natal's wildlife agency, has been reduced by provincial government (Khumalo & Molla 2012). Reduced funding coupled with low admission fees is creating financial constraints and undermine the capacity of the agency. Eventually, this will compromise biodiversity conservation and local development. Therefore, for conservation managers to find cost-effective ways of managing ecotourism operations, they will need empirical information on detailed evaluations of income and expenditure patterns of ecotourism operations. Measuring the financial performance of ecotourism operations in PPAs will enable EKZNW to control and improve operational practices in the respective PPAs. There are several operational performance measurement methods that have been employed in the literature to measure efficiency, prioritise conservation and justify investment in PPAs in various contexts. The most important of these include appraisal methods such as cost-effective analysis (e.g. Laycock et al. 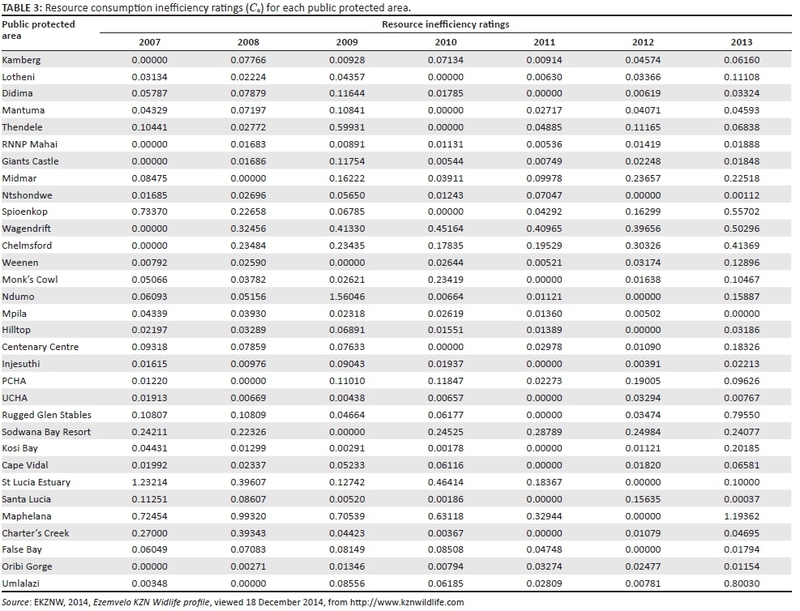 2009; Moran, Pearce & Wendelaar 1997), benefit-cost ratios (e.g. Dixon & Sherman 1991), cost-benefit analysis (e.g. Dixon & Sherman 1990) and so on. The various methods of comparing the costs and benefits of protected areas are summarised in Dixon and Sherman (1991). Data envelopment analysis (DEA) is a non-parametric method used to measure the relative efficiency of decision-making units (DMUs) (Charnes, Cooper & Rhodes 1978; Speelman et al. 2008). It has often been employed to assess the relative efficiency of DMUs of protected areas and to indicate how it could be improved by providing a set of guidelines (Bosetti & Locatelli 2006). Moreover, another method that imposes internal benchmarks to measure operational performance is total factor productivity (TFP), which is used to measure the changes in aggregate output per unit of aggregate input (Thirtle & Bottomley 1992). Nevertheless, these ratios and methods have various features that make it challenging to aggregate them to provide an understanding of the overall operational performance (Parkan 1996). Only time series data, unit prices and quantities can be used in the model to obtain performance measurements with TFP (Parkan 1996). Operational performance can be used for comparative analyses, as explained by Ghalayini and Noble (1996). According to Parkan (1996), examining the operational performance of a firm overtime introduces managers to aspects of comparison between operations across time and thus competition. Therefore, in each PPA, ecotourism operations that consume fewer resources and generate higher revenues in a specific year would have performed better or more competitively relative to other years. This means that operational performance measures the relative competitiveness of ecotourism operations over a period (Parkan 1996). Therefore, his study aims to examine the operational competitiveness of ecotourism operations in each PPA managed by EKZNW. This is performed using a non-parametric method called operational competitiveness rating analysis (OCRA). This method was selected because, according to the authors' knowledge, it is the first of its kind in South Africa to use the OCRA procedure to measure and assess the operational competitiveness of PPAs and it has an advantage over other methods. The advantage of the OCRA model is its capacity to show the period during which EKZNW's overall operational performance has been inadequate or more than adequate compared to other methods as well as the sources of those shortcomings and strengths (Parkan 1996). This is possible because of the way operational competitiveness ratings (revenue generation and resource consumption inefficiency ratings) are computed and its ability to incorporate management's perceptions of the relative importance of the cost and revenue categories. There have been frequent demands by the South African government for EKZNW to design and implement a strategy that is aligned with current trends on sustainable funding for protected area management, in which there is a need to balance between biodiversity conservation objectives and revenue generation (Dube 2011). The reasons for this request range from poor corporate governance, recurrent financial mismanagement and pressing socio-economic development needs (Dube 2011; Ridl 2012). EKZNW is considering new business models aimed at achieving business efficiency by optimising the use of financial resources and increasing its resource base (EKZNW 2009). Furthermore, EKZNW plans to focus on more effective marketing strategies to increase revenues (EKZNW 2009). According to Dube (2011), for EKZNW to reduce its dependence on government finance, it needs to focus on three areas, namely, payment for ecosystems services, public-private partnerships and co-management with the private sector and communities. 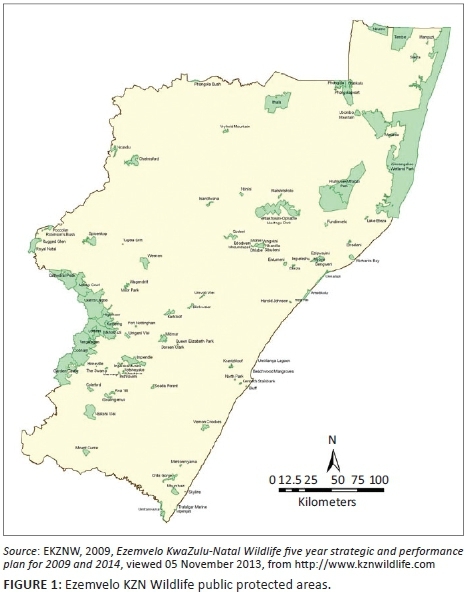 The KZN province covers an area of 92 285 km2, and is situated on the eastern coast of South Africa in a biologically rich transition zone between tropical biota in the north and subtropical biota in the south (Eeley, Lawes & Piper 1999; Goodman 2003). The abundance of KZN's biodiversity comes from its altitudinal gradient and its varied geology, topography and climate (Eeley et al. 1999; Goodman 2003). To evaluate the trends in the competitiveness of commercial operations in PPAs, financial data were collected from EKZNW for 2007-2013. Originally, the PPAs required were to be selected using the stratified random sampling strategy across all EKZNW administrative regions (uKhahlamba, Zululand and coastal regions), where between 35 and 50 PPAs mainly focused on ecotourism operations would have been selected. However, EKZNW was only able to provide 32 randomly selected PPAs from the 110 PPAs, some with a stronger conservation focus than a commercial operation, citing organisational privacy concerns. EKZNW provided PPAs selected randomly across uKhahlamba, Zululand and coastal regions with 14, 7 and 11 PPAs, respectively. 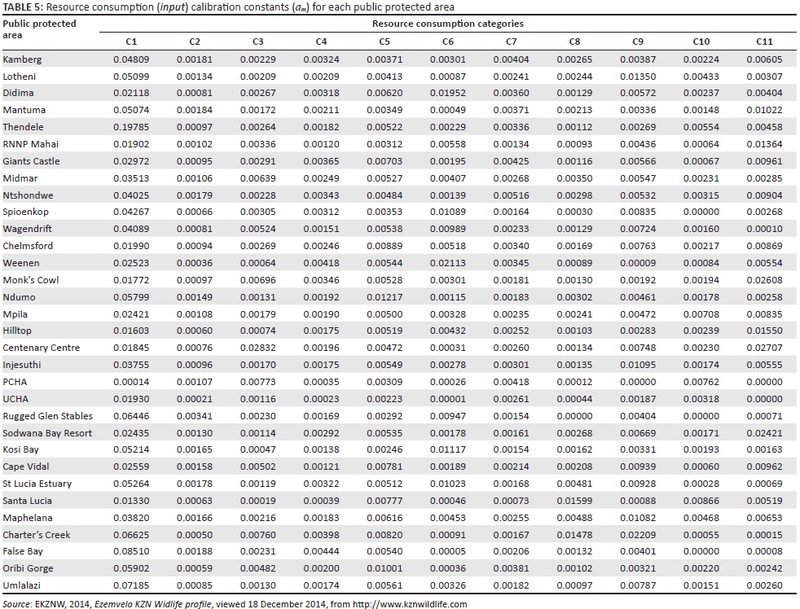 Therefore, there is a reduced possibility of sample selection bias in the study. The financial data provided consisted of annual cost and revenue values of commercial operations. 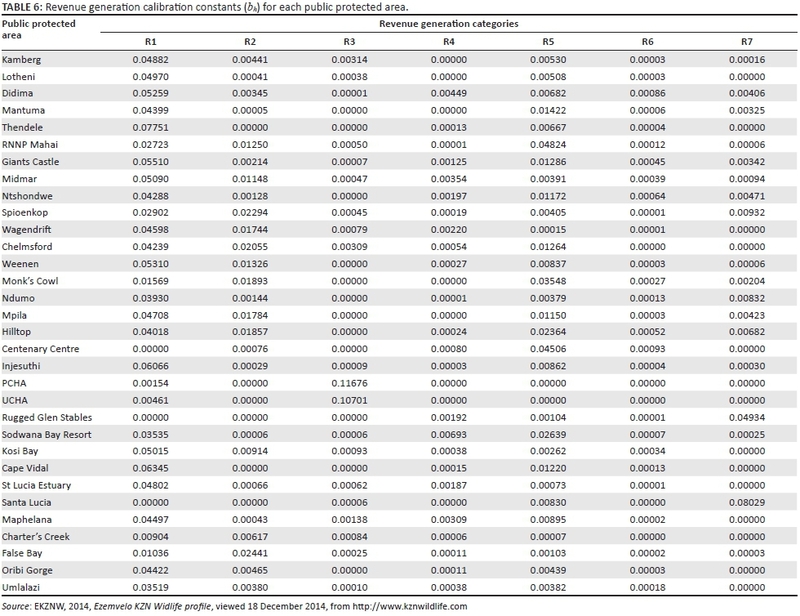 Cost and revenue values for each protected area were in nominal terms. Hence, the South African consumer price index was used to deflate the cost and revenue values for 2007-2013, taking 2005 as the base year. Cost and revenue items for each protected area were disaggregated and measured separately. In this study, cost categories are described as resources consumed and revenue categories as revenues generated. Thus, 11 cost categories and seven revenue categories were analysed per year, 2007-2013 (Table 1). Following Parkan (1996), the model can further be described as follows. In the model, an operating entity is represented by a PU in each year. A comparison is conducted of operational performance of k PUs that consume resources in C categories and generate revenues in the R categories. To compute cost and revenue inefficiency ratings, the prices and quantities of inputs and outputs could be used to obtain information about k PUs' relative input or output efficiency. Nonetheless, resource cost and revenue values can be used to obtain relative cost and revenue inefficiency ratings, respectively (see Parkan 1996 for details on derivation). In this study, because data on only cost and revenue values were used, the kth PU's cost and revenue vectors can be represented as vectors , respectively, with as the cost incurred for the ith resource and as the revenue generated from the jth output. Cost and revenue at PUk are denoted as and , where Ckm = costkm = 1ukm is the cost of the mth resource category, m = 1,……, M, and Rkh = revenuekh = 1vkh is the revenue generated from the hth category of outputs, h = 1, …, H, at PUk, k = 1,…., K.
which is the kth PU's relative resource inefficiency rating. The least inefficient PU will receive an inefficiency rating of zero. For details of the derivation, see Parkan (1999). At Mpila, meanwhile, the years that registered improvements in resource consumption inefficiency ratings, 2007-2009, coincided with the years that registered improvements in the combined inefficiency ratings. Furthermore, it was only in the year 2011 that Mpila registered the lowest relative combined inefficiency rating (Table 2), the same year resource consumption and revenue generation inefficiency ratings performed better. First, this implies that resource competitiveness had more influence on operational competitiveness because it performed better than revenue competitiveness in some years. Second, the results also imply that a combination of better performing revenue and resource competitiveness had a greater effect in improving operational competitiveness. The results seem to support the findings by Shieh (2012) that better cost efficiency leads to improved financial performance and by Tsaur (2001) that both low inefficiencies in revenue and costs can enhance operational performance. 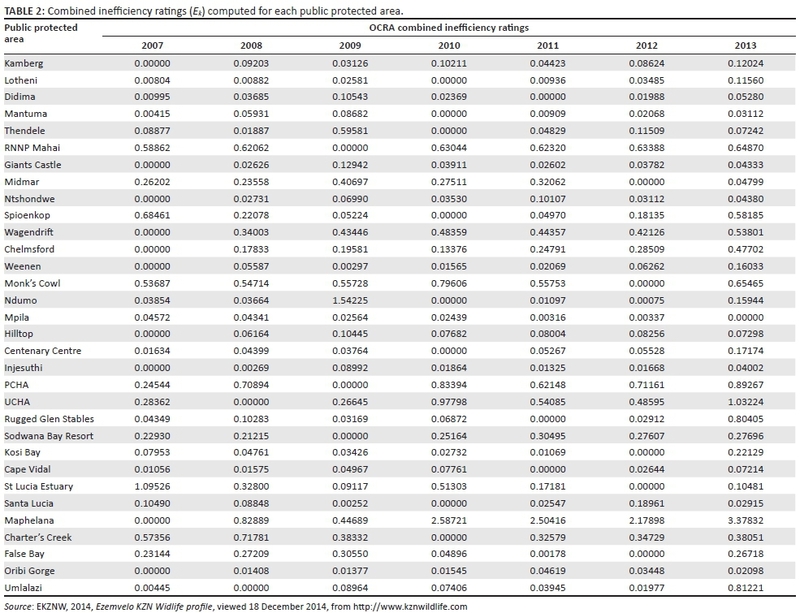 According to the results of Table 4 and Figure 2, for Kamberg in 2007, the most competitive year was 2007. Revenue became increasingly less competitive from 2008 to 2013. Mostly, the average shares of total revenues come from the R1, R2 and R3 categories. This suggests that from 2008 to 2013, revenue generators did not produce significant returns to offset the increasing inefficiency. There were sharp declines and increases in resource competitiveness between 2008 and 2011, and then a gradual decrease in competitiveness between 2012 and 2013. From Table 5, staff costs take the largest share of costs incurred by Kamberg, followed by utilities. This result suggests that increased cost control in staff and utility costs could improve Kamberg's resource competitiveness profile. The results presented in Table 3 (also see Figure 2) show that Midmar's resource competitiveness declined from 2007 to 2008. 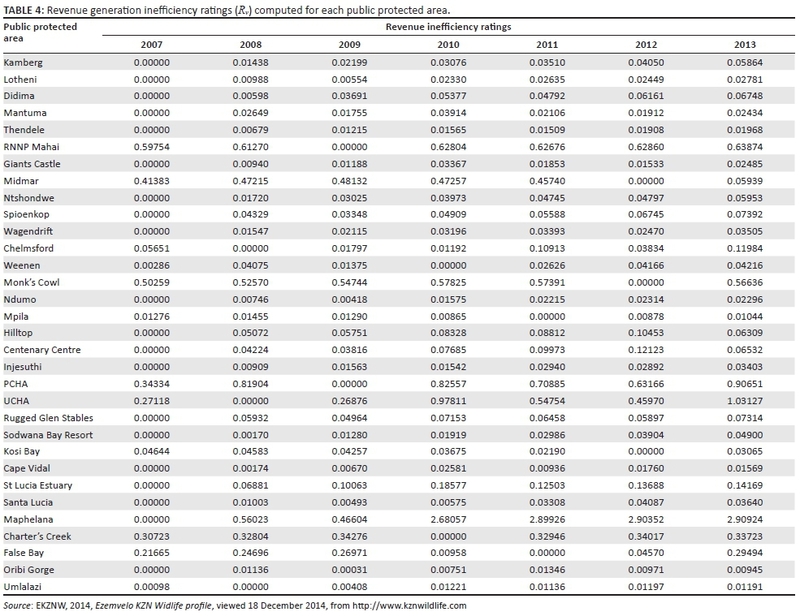 However, the inefficiency ratings increased in 2009 and declined in 2010. There was a gradual increase in the value of the ratings from 2011 to 2013. This suggests that categories with a higher average share of total costs (C1, C3, C5 and C9) had minimal impact on the improvement of resource competitiveness because of a lack of cost control, and improvements in this area will occur only if Midmar adopts cost-cutting strategies, without compromising on the quality of its services. Revenue generation inefficiency ratings increased slightly from 2007 to 2009, then declined dramatically from 2010 to 2012 and increased again in 2013. The revenue generation inefficiency ratings were still unacceptably high. The main revenue generators came from the R1 and R2 categories, and these did little to improve revenue competitiveness. This has the important implication that increasing the revenue share of accommodation and entrance fees can impact revenue competitiveness positively. According to Dube (2011), EKZNW offers outdated products that few clients can relate to and is stuck in traditional conservation practices that prevent it from taking advantage of new markets. It must modernise its services and products, maintaining natural capital and traditions of heritage value. The C11 (Cost of Sales Fuel, Curios and Other) category had the second largest average share of total costs at 0.9%. Cost of sales refers to the purchase price of goods sold at Ntshondwe such as fuel and curios. Because this cost is high, EKZNW can revise its business model around, for instance, outsourcing fuel sales to fuel companies or curio sales to local craft shops. The C9, C7 and C5 categories stand at 0.53%, 0.52% and 0.48%, respectively. One way in which management can reduce the high cost of utilities (C9) is by 'going green' (Pfister & Tierney 2008). This approach provides Ntshondwe and other PPAs with the opportunity to improve long-term profitability by lowering expenses and enshrining environmental stewardship, adding value to the EKZNW brand image of ecological responsibility. Ntshondwe and most PPAs can install solar panels in their accommodation facilities and in the camping area where electric plug points are available. The upfront cost of implementing these eco-friendly alternatives is high, but in most cases the returns on investment in the long term are excellent, largely because of recurrent cost savings (Rahman, Reynolds & Svaren 2012). Moreover, management should also review its maintenance strategies. According to PlantWeb (2003), the most basic and common maintenance strategy is the reactive and needs-based maintenance ('fix it when it breaks' strategy), but repair costs for infrastructure and equipment are higher than in most strategies. Therefore, management at Ntshondwe could utilise preventive, predictive and proactive maintenance strategies interchangeably, depending on the scale of the maintenance required. According to Table 6, Kamberg's main revenue generators between 2007 and 2013 were 'Accommodation' (R1-Chalets, Rustic Cottages and Rondavels), 'Admissions' (R2-Entrance Fees) and 'Sales' (R5-Sales Revenue from Operating Retail Stores). The revenue calibration constant or average share of total revenue for the 'Trails, Tours and Rides' (R7) was low at 0.016%. In addition, Giants Castle, Midmar and Ntshondwe also derived a large share of their total revenues from the R1 category with average revenue shares of 5.5%, 5.1% and 4.2%, respectively. Furthermore, the R5 category had the second highest relative importance to Giants Castle and Ntshondwe with average shares of total revenues of 1.3% and 1.2%, respectively. Meanwhile, Midmar's second highest revenue generator came from the R2 category, and this category had 1.2% of average shares of total revenues. In Midmar, the main activities were boating, yachting and fishing (EKZNW 2014). Therefore, it was rather surprising to find that the R3 category had the second lowest average share of total revenue at 0.047%. Giants Castle and Ntshondwe received significant revenues from the R7 category with average shares of total revenue at 0.34% and 0.47%, respectively. The results further indicate that Mpila derived a considerable proportion of its average shares of total revenues from the R1 category at 4.7%. This result is not surprising as accommodation has been found to be one of the main revenue generators for PPAs (Eagles 2002; Flanagan 2014; Porter et al. 2003). Accommodation at Mpila consists of 20 chalets and 15 tented camps. According to Flanagan (2014), chalets on average experience higher visitor occupation than other accommodation types offered by EKZNW. Therefore, PPAs with fewer chalets (like Mpila and Hilltop) should have been generating less revenue. Furthermore, Mpila, found in the Hluhluwe-iMfolozi Park, with an array of wildlife including the 'Big Five', derives low revenue from the R7 category with an average share of total revenue of 0.43%, which rather is surprising. This result, however, is consistent with Flanagan (2014), who has shown that the 'Big Five' animals had a statistically insignificant effect on revenues in PPAs. It could be that instead of paying for guided tours, visitors prefer to pay entrance fees to such areas and drive themselves to view wildlife. This also explains the 1.7% average share of total revenue in the R2 category, higher than the R7 category. The aim of this study was to measure the operational competitiveness of ecotourism operations of PPAs in EKZNW. This was performed through constructing an operational competitiveness profile for each PPA, using the OCRA procedure. Financial data for ecotourism operations in PPAs were collected from EKZNW for 2007-2013. The study showed that hunting generated more revenue than most of EKZNW's ecotourism operations and had the greatest effect on operational competitiveness. This implies that for management in EKZNW to improve its revenue competitiveness, it should implement strategies to scale up hunting-operations. However, it will only be possible to implement this strategy if EKZNW increases the number of hunting-sanctioned protected areas because currently only five have that status. This result has other implications as well, one of which is creating perverse incentives that could encourage EKZNW to move away from 'deep ecotourism', which is in line with conservation objectives, to 'shallow ecotourism', which is driven by local community development and beneficiation other than just conservation without the human dimension. Ecotourism activities such as trails, rides and tours generally had the lowest average share of total revenue. The implication is that management either needs to make guided tours more attractive or increase park fees to generate more income. The implementation of the latter will depend on the demand elasticities of park visits at EKZNW. K.D.M. was the main author responsible for data collection and analysis. E.W. was responsible for supervising the study, contributing to the write-up in terms of regular inputs and comments for improvement at various stages of the study, identifying relevant literature, reviewing the article, revising the article following reviewers' comments and responding to reviewers' comments.